Glass, Art, Entertainment, Fine Crafts All Await At Benzaiten Center For Creative Arts On Saturday, January 23rd! Where will you be on Saturday, January 23, 2016? Don’t miss a mega-event in conjunction with ArtSynergy 2016 at the Benzaiten Center for Creative Arts! Visitors will enjoy wine/beer/soda, hors d’oeuvres, and entertainment. Watch glass blowing and browse professional and emerging artists & galleries in one location! World renown glass artist, Laura Donefer will demo! Kudos to McMow Art Glass, Habatat Galleries and Benzaiten Center for Creative Arts for bringing the arts community together for this event! Individual artists, galleries and arts organizations will have items for sale the entire time. 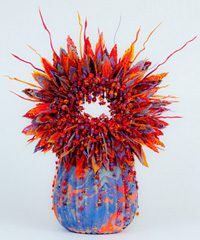 The Rickie Report shares some sneak peeks of Laura Donefer’s amazing glass work and all of the details! The hot new place to be this season is located in an Historic FEC Train Depot building in the heart of the City of Lake Worth, Florida. The 14,000 square foot Benzaiten Center for Creative Arts is attracting hundreds of interested people to its brand new hot shop. With three glory holes and two furnaces they have been scheduling back-to-back classes ever since they reopened in October. Throughout the summer, Founder, JB Berkow along with Anita Holmes, Executive Director and Rick Eggert, Creative Director have worked hard to design an impressive line up of programming for the upcoming season. 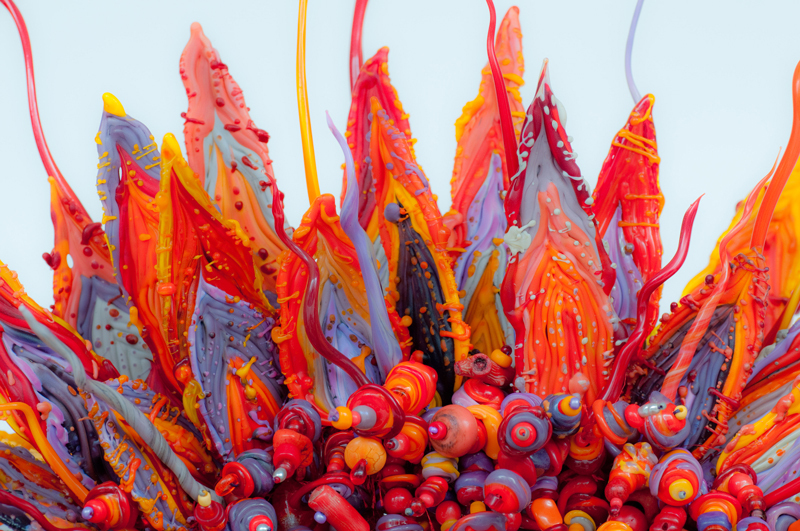 They have four outstanding, world renowned Visiting Glass Artists coming to the center in 2016. These events will be three-day affairs. Thursday nights will be a private sit-down-dinner party where the artist will talk about their processes and inspirations. Friday nights will be a gallery opening centering around the visiting artist’s works and featuring two dimensional works by local artists. Finally, Saturday will be an afternoon demonstration by the visiting artist. Never before has there been this type of opportunity for Palm Beach County residents to meet and greet four of the top glass artists in the world and have the rare chance to learn about their processes, inspirations and actually see them creating. Visit the Center’s website to view the details and to register and pay for the Thursday and Friday night events. The first of these events will coincide with the Lake Worth Art Synergy Event, which the Benzaiten Center is hosting for the second year in a row. Last year they had 32 local artists and organizations taking part in a mini-art-fair within the empty 5,000 square foot space of the building that will eventually house their fine art metal foundry. This year the highlight and kick-off to the event will be world-renowned glass artist, Laura Donefer, conducting a glass-blowing demo from 4pm to 6pm on Saturday, January 23. After that, will be an Art Synergy Awards Ceremony. Festivities will continue until 8pm with live music, light nibbles, wine and beer and is open to the public free of charge. They also have a stimulating series of lectures every first Tuesday of the month from 6pm – 8pm. Every second Wednesday of the month they hold a Hump of the Hump Happy Hour from 5:30pm – 7:30pm in the evening featuring a glass blowing demo, wine, beer, and live entertainment. There are several fundraisers planned for the 2016 season including their signature event, ‘Glasstronomique,’ a ‘Casablanca Casino Night,’ and a cocktail party in the home of a major glass collector. They will also hold a community ‘Summer Solstice’ party in June. Again, check website for dates, times and registration details. What’s New In Artists’ Alley? Stop By And See! The Rickie Report is pleased to share exciting news from Artists Alley! In addition to their monthly Open Studio event on Thursday,January 16th, they are inviting everyone to Saturday in The Studios – every week! There is nothing like meeting the artist who creates the work that you love and appreciate. More details are in this article. Beginning, Intermediate & Advanced Pottery Classes Available. $40 for 2 Hrs Materials included. LOCATION – The alley runs north and south between NE 3rd and 4th Streets, east of 3rd Avenue and west of the RR tracks. FREE PARKING – in the city lot on NE 3rd Avenue just south of NE 4th St. This is the best parking for our events. It’s a well lit parking lot a half a block away. New Art and Artists in Artists Alley! Open Studios Beckon! The Rickie Report is pleased to share lots of exciting new art and artists in Artists Alley, Delray Beach! There is a special Open Studio event on Thursday, September 19th. We hope you will stop by and meet the artists! There is nothing like meeting the artist who creates the work that you love and appreciate. More details are in this article. There’s lots of exciting new art in Artists Alley! TULLOS STUDIOS– Steve Blackwood, whose work is displayed at Cacace Fine Art, has created a beautiful studio building called Tullos Studios. This is the blue building that houses pioneer Amanda Johnson’s space. At the Blackwood Studio you’ll find Steve’s working studio along with the stained glass studio of Carola Blackwood and a pleasant studio gallery. In the studio gallery, Diane Carter will be showing her intimate nature photography and there will be a retrospective exhibit of the reverse-painted windows of outsider artist Mark Adams. We’re also delighted to welcome the talents of the painters, Ona Steele and Jan Murphy who have set-up their new studios in Tullos Studios. Another great addition to the alley is the beautiful new space of Pat Kaufman in the back of Ian Levinson’s Cloud House Pottery. The Rickie Report is pleased to share this article with you because we always enjoy seeing the efforts of community-based artists. Artists Alley is giving you a sneak peek before their Open Studios with some new works. You’ll also have the opportunity to meet some of the new artists in the neighborhood! Be there on July 18th! Delray Beach continues a long-time tradition, with a new flourish of artists setting up their studios in Artists Alley and creating beautiful art right here in downtown. Eric Bossik offers ongoing Classical Charcoal Drawing and Oil Painting courses at the Bossik Academy of Fine Art. One of Amanda’s “Precious Metal” series. Ian Levinson has been a ceramic artist since 1981. Welcome Robert J. Schmidt, Owner of Schmidt Stained Glass to Artists Alley. This is a 2 dimensional fused, leaded and copper foiled art glass panel. This window incorporates a flattened Van Gogh Blue vodka bottle. Perfect for any restaurant or home bar. Come and be inspired and amazed with the talents of your hometown artists and support this evolving art colony. Cacace Fine Art located at Artists Alley will be presenting new paintings by artist, James P. Kerr. The Rickie Report knows you will appreciate his expressionistic abstracts which are collected the world over. Read more about the other Open Studios of Artists Alley for Third Thursday in Delray Beach! James P. Kerr will be showing new paintings at Cacace Fine Art. His show opens on March 21st from 6-9 pm. at Our Third Thursday Open Studios & Galleries night. James has been an artist and educator of oil painting for the last 40 years. His work ranges from neo-impressionist landscapes to expressionistic abstracts and is collected internationally. His roots are from Buffalo, NY, Gloucester, MA and the mountains of NC. He was a personal friend and painted with Emil Gruppe. His bold, painterly style with thick, juicy strokes of beautiful color is admired by both artists and collectors. This will be the largest exhibition of his work this year and is a wonderful opportunity to acquire an original James P. Kerr for your collection. For more information or a private preview, call Vincent at 561-523-5300. The Rickie Report has been telling you about Artists Alley, a distinctive community of artists and artisans who make Delray Beach their creative home. Each month, their Open Studios on Third Thursdays, offer the public a glimpse into what makes each artist and studio unique. Not only are you invited to their Open Studios, but also to take part in classes and workshops many of the artists are offering. We believe it is never too late to try something new – and this is your opportunity! For those that have painted before. Everyone starts and finishes a painting of the same subject. The whole process is analyzed and verbalized. Primarily for beginners, same format as Tues. with more attention to the basics. Class size is very limited. Please call or email Vincent to reserve your spot. Play with Mud, feel like a kid again. 4 pottery lessons, two hours each, one-on-one instruction, all supplies included: $170. Call 718-312-2304 for more information and to reserve your space. Have you ever said, ” I wish I knew about this when it first started -I wouldn’t have missed so much”? The Rickie Report knows what you’re missing and doesn’t want you to be kicking yourself later! Experience ARTISTS ALLEY–an authentic and thriving colony of artists working together to inspire artistic expression, incubate new artists and create innovative artwork. Once you go there, you’ll understand why the City of Delray Beach is on the Artists Alley bandwagon, too! Stop by the Open Studios and perhaps sign up for a class – honing your skills or learning new ones is a great way to start 2013. EXPERIENCE ARTISTS ALLEY–an authentic and thriving colony of artists working together to inspire artistic expression, incubate new artists and create innovative artwork. This exciting new, warehouse arts area is in the Pineapple Grove Arts District in downtown Delray Beach, Florida. See their video at ArtistsAlleyDelray.com !